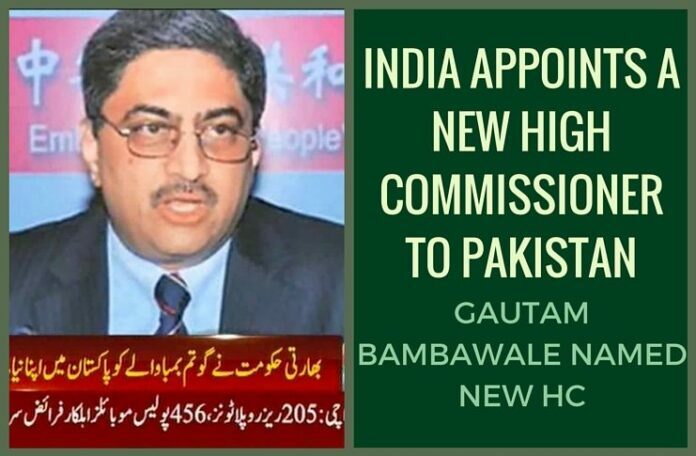 [dropcap color=”#008040″ boxed=”yes” boxed_radius=”8px” class=”” id=””]N[/dropcap]ew Delhi, Dec 23 – Gautam H. Bambawale, presently Indian ambassador to Bhutan, was on Wednesday named India’s new high commissioner to Pakistan. “Gautam H. Bambawale, (IFS: 1984), presently ambassador of India to Royal Government of Bhutan, has been appointed as the next high commissioner of India to the Islamic Republic of Pakistan,” the external affairs ministry said in a statement. He will replace T.C.A. Raghavan in Islamabad. Bambawale is expected to take up his assignment shortly, the statement said. The appointment assumes significance as it comes in the wake of India and Pakistan deciding to start a comprehensive bilateral dialogue during External Affairs Minister Sushma Swaraj’s visit to Islamabad earlier this month. Foreign secretary-level talks between the two sides are expected to be held at a mutually convenient date in January.